Product #5866 | SKU C577WR | 0.0 (no ratings yet) Thanks for your rating! 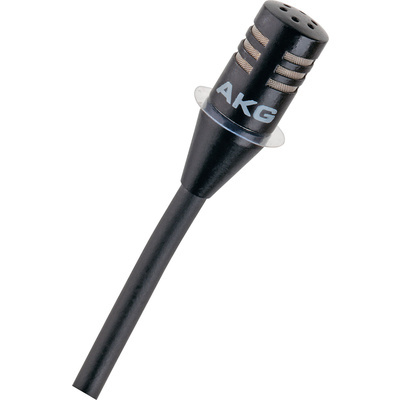 An excellent choice for performance and theatrical applications, the AKG C577WR is a miniature omni-directonal lavalier microphone with a moisture resistant design. The capsule features a transparent plastic ring that protects against body moisture and humidity without affecting signal quality. The C577WR features a wide frequency response and it's omni-directional polar pattern provides a generous pickup area at the direct and off-axis sections of the microphone. The pattern is ideal for indirect microphone placement, such as in hair, underneath clothing, etc. An external windscreen is supplied and the C577WR is powered with external 9V to 52V phantom power.